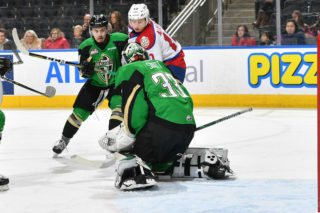 The Moose Jaw Warriors (14-5-3-1) trailed 1-0 past the midway point of the game, but they responded with three unanswered goals to defeat the Edmonton Oil Kings (14-11-2-2), 3-1, in front of 7,292 fans at Rogers Place on Friday night. 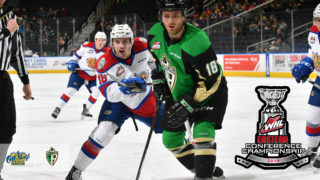 Brett Kemp scored the lone goal for the Oil Kings, who dropped their fourth straight game (0-3-1-0). Assists on his goal were earned by Conner McDonald and Trey Fix-Wolansky, who inched closer to the 200-point club with his 199th career WHL regular season point. 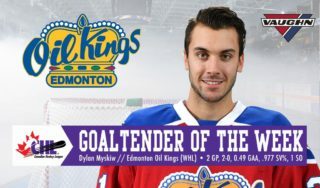 Dylan Myskiw (11-7-2-1) suffered his second straight regulation loss, making 19 saves on 22 shots. 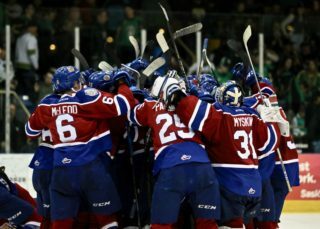 Adam Evanoff (6-3-1-0) picked up the win, allowing one goal on 36 Oil Kings shots. Kemp gave the Oil Kings a 1-0 lead with his 18th of the season at 15:17 of the opening period. The goal was originally credited to Vince Loschiavo who would have scored against his former club, but instead the power play goal was changed, with Fix-Wolansky and McDonald picking up the assists. Edmonton took that 1-0 lead into the first intermission, also leading in shots 8-5. Just past the midway point of the second period the Warriors got on the board, as Brayden Tracey extended his point streak to nine games (5G, 11A) with his ninth goal of the season, from Tristin Langan, at 10:55. Nearly two-and-a-half minutes later the Warriors took the lead, 2-1, on Yegor Buyalski’s fifth of the campaign, from Peyton McKenzie and Matthew Benson at 13:22 which sent the game to the second intermission. Shots on goal through 40 minutes of play were 22-17, Oil Kings. Just under three minutes into the third the Warriors added to their lead, 3-1, as Justin Almeida notched his fifth of the season, from Jett Woo and Langan at 2:57. Moose Jaw was 0-for-2 on the power play while Edmonton finished the night going 1-for-1 with the man advantage. Brett Kemp (EDM) (3), Tristin Langan (MJ) (2), and Adam Evanoff (MJ) (1) were selected as the Three Stars of the Game. Wyatt McLeod, Ethan Cap and Matthew Robertson each wore an “A” and skated as alternates to captain Trey Fix-Wolansky. Prior to the game, Trey Fix-Wolansky was named the winner of the Maximum Health & Nutrition Trophy for the months of September and October, combined. The trophy is presented to the player who receives the most Three Star nominations during the month. 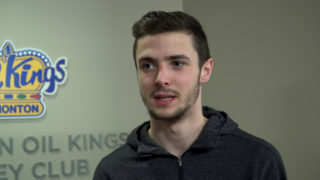 Fix-Wolansky was named one of the game’s Three Stars a total of seven times throughout the first two months of the season. 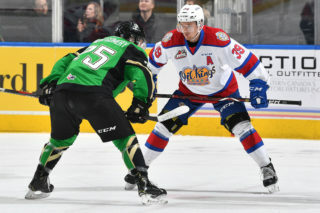 The Oil Kings take to the road tomorrow, Saturday, December 1 to take on the Calgary Hitmen for a 7:00 PM start. They return home to Rogers Place on Wednesday, December 5 when they host the Regina Pats at 7:00 PM.